Our board serves as the strategic and financial leaders of the Foundation, providing guidance to the Executive Director and the staff on how to best fulfill our mission. Larry became an active volunteer on the VIRGINIA V during the final years of the 90s restoration. He painted, sanded, cleaned, and did whatever else was needed during that time. Once that project was complete, he continued to volunteer as a deck crew, and first served on the board from 2004-2010. Larry has strong ties to the Pacific Northwest, he (nearly) a lifelong Washington resident and graduate of the University of Washington. 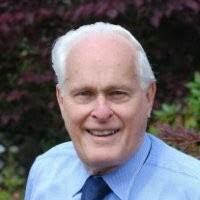 Larry is a retired CPA work spending most of his career in the auditing department of Haskins & Sells. He had been active with the American Cancer Society, and the Classic Yacht Association where he served as the Pacific Northwest Fleet Commodore in 2007, and the International Fleet Commodore in 2012. Larry also met his “sweetie,” Tina, volunteering on board the VIRGINIA V.
Larry is well known in the Seattle boating community for his 1954 wooden cruiser THELONIUS, which he sails an estimated 100 days a year, including an annual 6-week tour often up to Desolation Sound and shows the vessel at the Wooden Boat Shows in Vancouver, Victoria and Port Townsend annually. Nina’s first exposure of the VIRGINIA V came as a guest on a public cruise in 2009. She took somewhat regular trips as a guest (which she spent most of the time in front of the engine) for three years before starting as an engineering volunteer. Nina has an extensive background in the medical field. She was a practicing physical therapist for 38 years before transitioning working largely in the occupational therapy space. She has a degree in Human Centered Design and Engineering along with degrees in Physical Therapy and Higher Education & Curriculum Development. Nina grew up in New York and Ireland “never too far from boats or water.” She met her husband (Doug Weeks) volunteering on board the VIRGINIA V. They own a 1938 wooden Bridgedeck Cruise ASTELLE. In addition the Virginia V Foundation, Nina has been deeply involved with CWB, and multiple arts and music organizations in Tacoma. She also recently complied a course in marine survey and passed her Chief Engineering Licensing Exam. David’s first exposure to the VIRGINIA V was as a charter client in the mid-1980s. When looking to for a boat to entertain his company’s distributors, he learned about the VIRIGINA V and thought the unique history and character of the vessel would be perfect. A major selling point of the vessel was the ability to see the historic 1904 steam engine operate while underway. David is an internationally recognized expert in the fields of bar coding and automatic identification, creating five bar code symbologies. He helped build Intermec Corporation from a start-up to the leading manufacturer of bar code printing and reading equipment, rising to the position of President and CEO before he left in 1987. He went on to found PathGuide Technologies, Inc. in 1989, which develops and implements warehouse management systems for wholesale distributors and regional retailers. David first experience with the VIRGINIA V was while he was in college and some friends rented the boat for a private event. He was already working summers as a ferry boat Able Seaman and still feels a connection to the vessel as a precursor to WA State Ferry System. 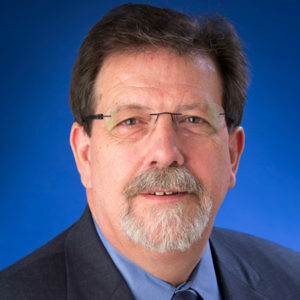 Dave is a veteran labor leader in the Puget Sound region who currently serves as the Senior Director, Labor Relations at the Port of Seattle. He has more than 20 years of experience in the maritime labor issues. An early supporter of the Youth Maritime Training Association (YMTA), Dave knows the importance of filling the maritime labor pipeline and supporting our maritime heritage. Dave stays connect to the water through his work at the Port. In his off time Dave and his wife Renee travel and take road trips on their motorcycles. A third generation Washingtonian, Dave was born and raised in Kitsap County and currently resides on Mercer Island. Mel’s first experience with the VIRGINIA V was on an underway trip with the Alumni Association for the United State Merchant Marine Academy (USMMA) at Kings Point, NY. 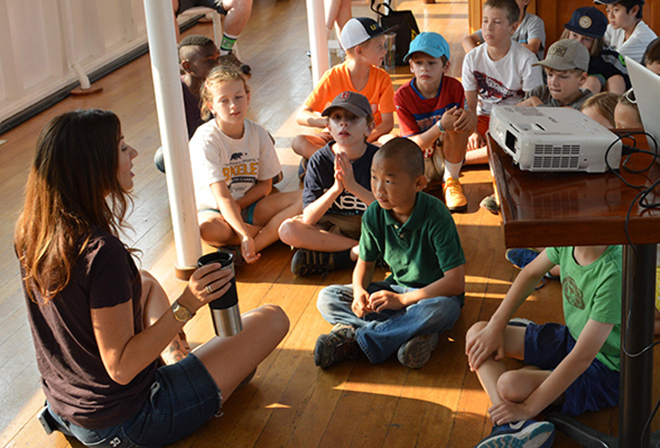 Mel likes the historic nature of the vessel and that it is being used to introduce younger kids to the maritime industry. He has an active member of the Rotary club where he was one of several Rotarians credited with building Aberdeen’s Rotary Log Pavilion. He also served on the local Board of the Boy Scouts in Aberdeen. Mel is an active member of the USMMA Alumni Association. Mel and his wife, Ellen, are owners of 60’ wooden cruising yacht (CAPELLA) designed by Bill Garden and built by Vic Franck in Seattle. They are also members of the Tyee Yacht Club and the Classic Yacht Association. Garret was initially attracted to the history of the vessel. During his freshman year of college (at the University of Washington) he attended a volunteer orientation believing the VIRGINIA V was a non-operational floating museum. 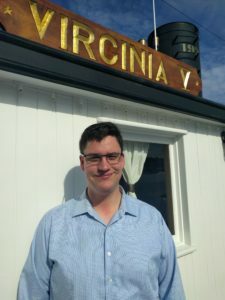 After learning the vessel operated Garret, along with his twin brother, Kyle, began volunteering in the engine room of the VIRGINIA V. Garret used his volunteering experience on the VIRGINIA V as a major part of his application to the Material Science program at UW. Garret works as an engineer at a Biotech startup, Northshore Bio, in the South Lake Union neighborhood of Seattle where they are developing a nanopore molecular detector to be used in genetic sequencing. (only a little different than our 1904 steam engine). Garret joined the Board in 2017 and is an active member of the Operations and Board Nominating Committees and continues to be a regular engineering volunteer. He is also active with the Society of Naval Architects and Marine Engineers and with the UW Engineering School. In 2017, he purchased a 1946 40’ wooden cruiser CATOCIN.